After a wonderful 5-day trip to Hilton Head over Labor Day weekend, I was excited to get back home to my normal routine and get ready for fall, my favorite time of the year. What I didn’t expect was to wake up with a sore throat Wednesday morning, right after a 15 degree drop in temperature that felt great, and proceed to have one of the worst colds I’ve ever had in my life. By Wednesday night, I was pretty much worthless, and astounded at how fast and hard this cold hit me. I’m guessing a lot of it has to do with pregnancy and a weakened immune system. But that that’s ok, so long as baby boy is still healthy inside me, I can tough this thing out with only some Tylenol to help reduce the low-grade fever. 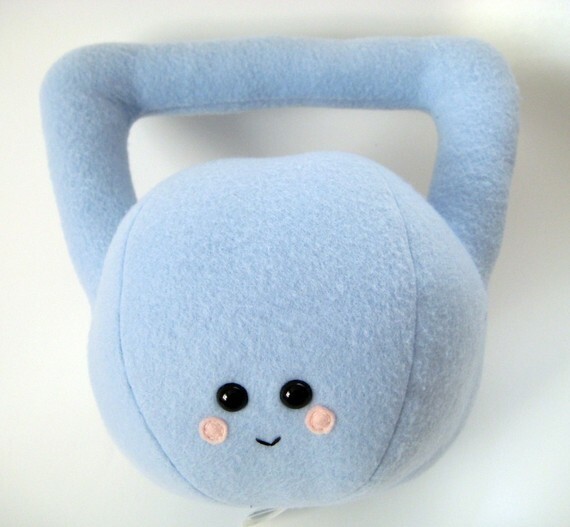 Sidenote, but I saw this Kettlebell Plushieon a blog I follow and absolutely love it. It said the esty seller was sold out, but I emailed her and she sent me a direct link to order one. The back of the kettlebell says 1 ton. I told her that if she ever made a batch that said 1 pood, she’d get a lot of CrossFitters as customers 🙂 Can’t wait to see Baby Hobson playing with this in daddy’s gym when he’s a toddler. Despite being sick, the good news is today I’m 6 months, or 24 weeks. I had my OB appointment earlier this week, and everything looks good. Though I found out I have to take the glucose test next month. Not looking forward to that, but hopefully I’ll be able to stomach the orange stuff without embarrassing myself. When I’m not sick, I’m still working out at the gym about 4 days a week. At this point, I’m definitely getting a workout just from doing our dynamic warm-up, but I appease my ego with that well-known CrossFit phrase, “Our warm-up is your workout.” Ha. It helps. We’re still doing periodization at the gym, so I’m capping my lifts at about 95lbs for cleans and jerks, 85lbs for bench, 155lbs for deadlifts and 70lbs for shoulder press. I figure I’ll stay at those weights for the next couple months until I have to lower them. 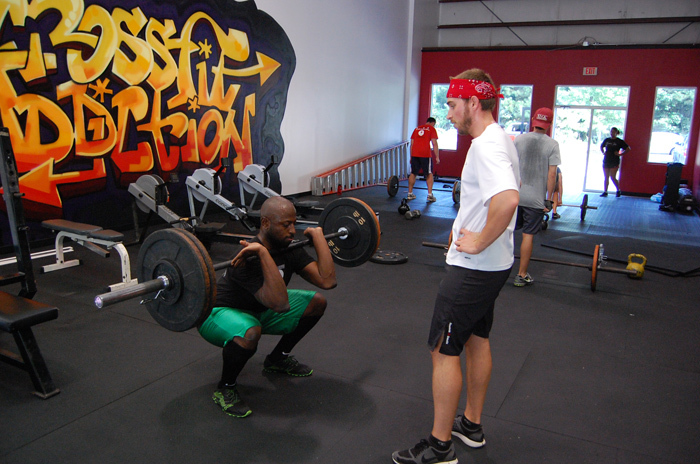 Today is CrossFit Addiction‘s grand re-opening at our new, large, chic location. I had planned out what I wanted to make for the lunchtime event a week ago, but as Thursday and Friday rolled around and I left work a couple hours early each day, it was all I could do to stay awake on the couch, much less whip up some paleo and gluten-free concoctions. Yesterday, after an 1.5 hour nap at 4pm and going to bed at 9:30pm, I woke up at 5:30am this morning feeling not great, but alive, and knowing that if I was going to make anything for the event today, I might as well do it early. So by 10am, I had made Bacon-Wrapped Prune Smokies, Jalapeño Poppers, a homemade version of iced pumpkin spice latte and a gluten-free, refined-sugar-free version of this delicious looking cake I saw on the cover of the latest Southern Living. If my substitutions turn out well, I’ll post the recipe soon.